Desert Wildflowers will begin to appear sometime around mid February...If the mid Winter and early Spring brings some rain. Last year's rainfall was barely adequate. So if you are fond of Mother Nature's Spring time Extravaganza, Pray for RAIN! 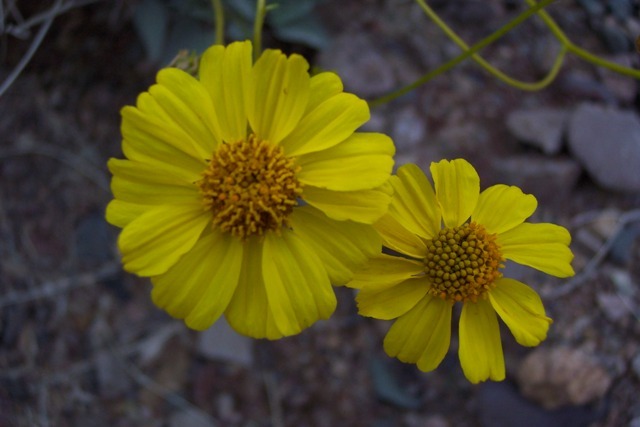 As winter flows into spring park rangers will begin to give regular Wild Flower Updates. RHYOLITE—(four miles West of Beatty on Hwy 374) Boom to bust, the story of many early mining towns in Nevada run about the same, but Rhyolite is quite the exception. It certainly boomed and it definitely busted, but what remains of what could-have-been is a must-see for any visitor to Beatty. Just four miles west of Beatty, Rhyolite was born in 1905, when samples of gold-laced rock were found in the Bullfrog Mining District. Such a discovery resulted in the usual real estate boom. population spurt was the potential Rhyolite had — and embraced – to become the next Nevada metropolis. Built of stone and concrete, the town had three-story office buildings, banks, churches, an opera house, hotels, a school, dozens of streets, all complete with plumbing, electricity and telephone service. The town even had a stock exchange and gained the attention of investors in New York and San Francisco, as stock promoters sold speculative shares in Rhyolite ventures. Not to mention the red light district... How could a town that seemed set to stand the test of time, crumble to the ghost town status it proclaims today? 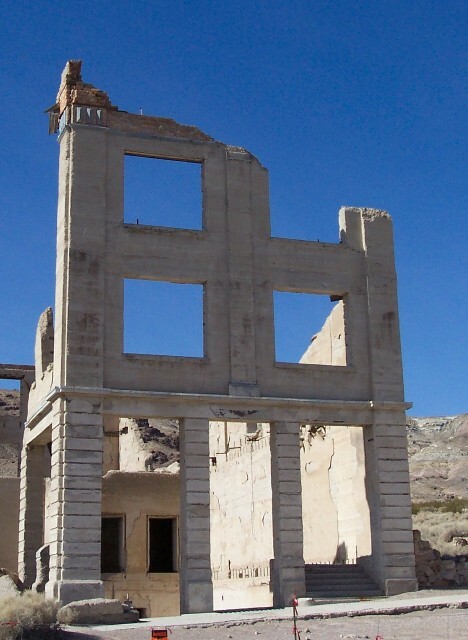 Rhyolite has been likened to “the culmination of the gold rush era.” Those who had missed out on earlier booms was not going to let this one pass them by.Odyssey of a Ghost Town Explorer, Chapter 2 Nevada Magazine Article. 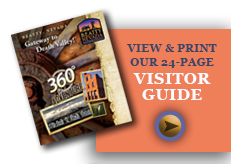 While you are here, be sure to visit the famous Kelly Bottle House, Goldwell Open Air Museum and Historic Rhyolite Train Depot. The mining Tunnel—(Just past Death Valley mile post 14) You will find an abandoned tunnel in a rock outcropping on the right, a few short feet from the road. Stop, get out your flashlight, and explore! Less than a hundred feet long the tunnel is tall enough for most tall people to stand erect, the floor is flat, and there are no holes. What the miner was seeking is something of a mystery, but the tunnel shows that he was an experienced miner. Be sure to watch for local inhabitants and give them room--they prefer solitude! The National Park has deemed this mining tunnel to be unsafe and you can no longer enter it. However, because of its length, you can still use your flash light or the flash on your camera to see into the tunnel. 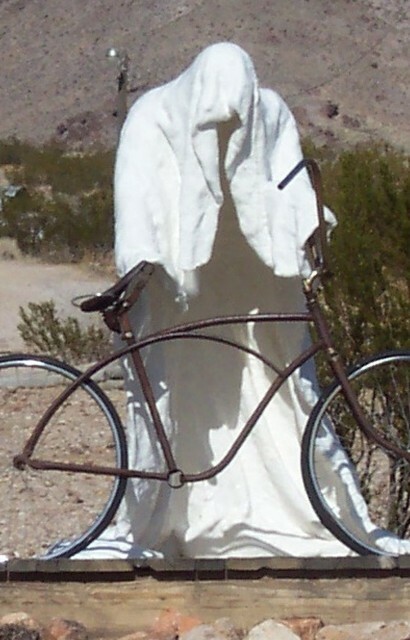 Hell’s Gate—16 to 19 miles from Beatty (on Hwy 374 beginning at approximately Death Valley Mile Post 10). Imagine traveling in a wagon and coming out of the canyon to be hit with a wall of heat that is like opening an oven door. You can experience this today by opening your car windows and sticking your hand out beginning at about 16 miles from Beatty. Within the next mile or so you should be able to feel the sudden change in temperature! Welcome to Hell’s Gate. When the wind is blowing, as it often does in this area, the temperature change is more gradual with pockets of warmer and cooler air until a short distance before the Hell's Gate Rest Area. Just around the corner is the Hell’s gate information area and your first spectacular view of Death Valley opens out in front of you. 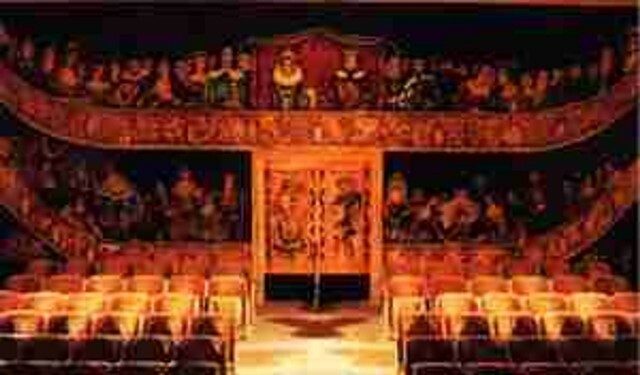 There are few other locations with such a photographic view of such a large area-be sure to get a picture or two! BEATTY MUSEUM--The Beatty Museum and Historical Society that you will visit today is only the latest in what seems like an ever evolving effort to preserve the history of the town, the county, and the Bullfrog Mining District. 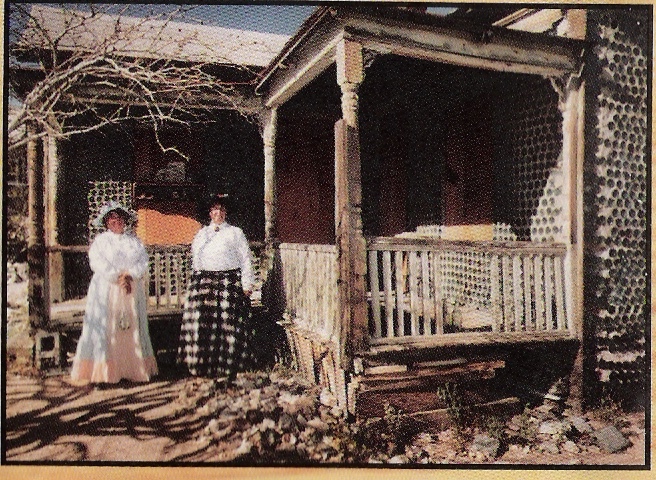 Began by three women of Beatty, who had “played in Rhyolite and roamed the hills of the Bullfrog Mining District,” the first museum, established in 1995, was just a small cottage. The collection of documents, books, photos and other artifacts has grown into its current home on Beatty’s Main Street. The latest edition to the museum is an outdoor display of equipment used in the old mining district. The Beatty Museum and Historical Society is open Monday through Sunday, from 10 AM to 4 PM. Phone: 775-553-2303. Follow the link above to visit the Beatty Museum site. Beatty Mudmound--From a distance this fascinating outcropping of limestone, about 2 miles south and east of town is simply an out cropping of pale gray rock. 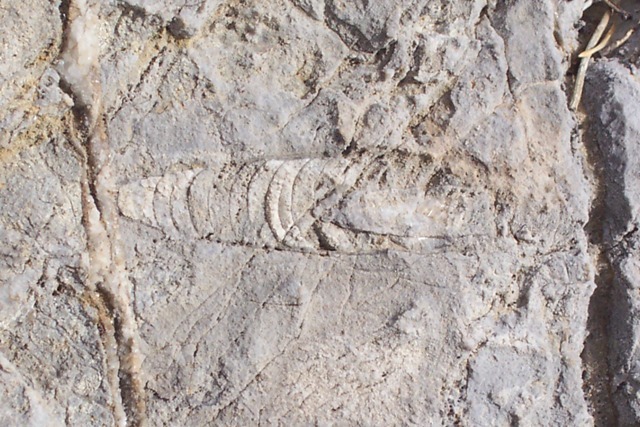 But once up close and personal, the casual rock hound can find a wealth of excellently preserved fossil remains some 480 million years old: sponges, tiny crustaceans-related to barnacles, gastropods, and brachiopods as well as others. These Ordovician mudmounds/ bioherms were, in effect, huge underwater mud dunes, able to trap sediments driven by the prevailing sea currents. The mudmound near Beatty probably developed scores of miles from the ancient Ordovician shoreline in seawater shallow enough to allow monstrous algae mats to flourish and enormous quantities of animal life to thrive along the flanks of the mound. The Swiss Cheese Outcropping-- This unusual rock formation can be found a few miles outside of Beatty, near the Mudmound. Filled with holes this outcropping is an interesting place to explore. You might choose to camp in the area protected by this formation, and you just might be treated to a sighting of a bighorn sheep. BIRDING--A true oasis from the harsh environments of the Mojave and Great Basin Deserts — the trees, wetlands and open spaces along the Amargosa River also give habitat to year-round resident birds and nesting seasonal birds, regularly supporting 21 species that have been identified as NV Partners in Flight conservation priorities. 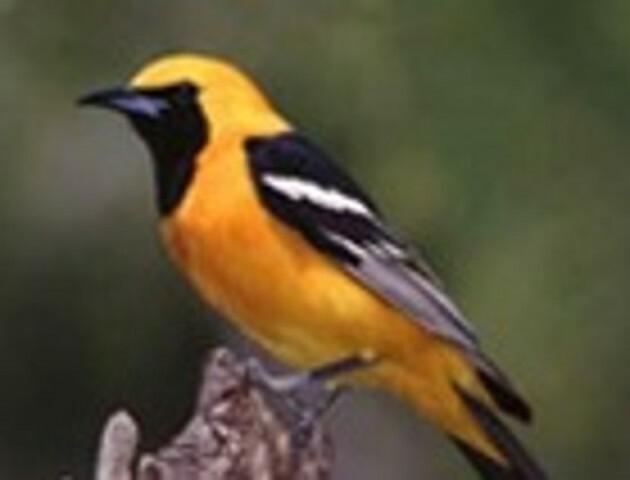 Surveys have recorded some 100 species of Neotropical migrants that make use of this area during spring or fall migration. The area also hosts a significant number of single-species concentrations, with more than 25,000 individuals from four groups of the wood warbler family passing through each spring. For optimal viewing, birders should check out areas along the Amargosa River, Species Springs, Vanderbilt Springs, and Indian Springs. SPECIES SPRINGS is another watering hole that is in Tarantula Canyon about five miles southeast of Beatty. VANDERBILT SPRINGS and Bombo’s Pond are south of town, right next to Highway 95. Hidden by the tamarisk trees, this watering hole is enjoyed by many for catch-and-release fishing. 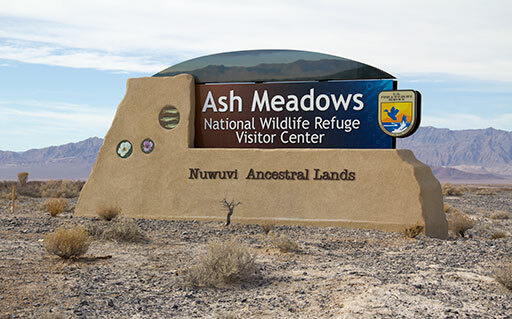 Ash Meadows National Wildlife Refuge --The 23,000-acre Ash Meadows National Wildlife Refuge is part of the larger, which also includes: the, the Moapa Valley National Wildlife Refuge, and the Pahranagat National Wildlife Refuge.Ash Meadows is within the Amargosa Desert, of the Mojave Desert ecoregion. The Amargosa River is a visible part of the valley hydrology, and has seasonal surface flow passing southwards adjacent to the preserve, to later enter Death Valley.Ash Meadows provides a valuable and unprecedented example of desert oases habitats that have become extremely uncommon in the southwestern deserts. The refuge is a major discharge point for a vast underground aquifer water system, reaching more than 100 mi (160 km) to the northeast. Water-bearing strata come to the surface in more than thirty seeps and springs, providing a rich, complex variety of mesic habitats. Virtually all of the water at Ash Meadows is fossil water, believed to have entered the ground water system tens of thousands of years ago. Numerous stream channels and wetlands are scattered throughout the refuge. To the north and west are the remnants of Carson Slough, which was drained and mined for its peat in the 1960s. 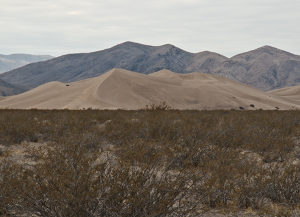 Sand dunes occur in the western and southern parts of the refuge. Big Dune- -is a formation of sand dunes, cresting approximately 300 feet (91 m) above surrounding terrain. The dune formation and surrounding land is administered by the BLM and is open to motorized and non-motorized recreational uses. Big Dune is accessible from Valley View Road, approximately 2.5 miles (4.0 km) south of U.S. 95. DESERT ADVENTURES OFFROADING... Think you're tough? These proving grounds put the extreme in extreme possibilities! Prepare to get up close and personal with a whole new level of punishment when you take it up against the most hostile and demanding rival you'll ever encounter. Beatty, Nevada. Maybe you like rock climbing, we have plenty of areas for you. 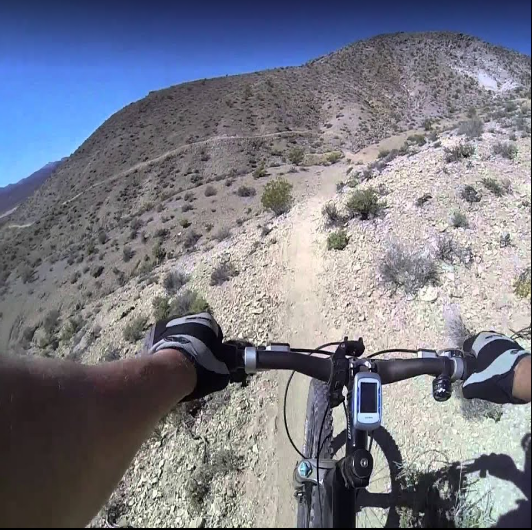 If you are more into Mountain Biking or hiking we have a huge trail system, both for the beginner and for the experienced, the Beatty Nevada Trails has a course for you. Visit www.Trails-OV for more information. 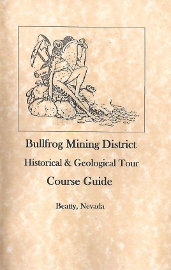 If you are more into the Dirt Bike, ATV or Jeep Adventures, check out the Bullfrog Historical Mining District Course. This is a 42.7 mile course which features the History and Geology of the Bullfrog Mining District. The Map and Course Guide Booklets are for sale at the Beatty Chamber of Commerce, The Beatty Museum and the VFW for $10.00. 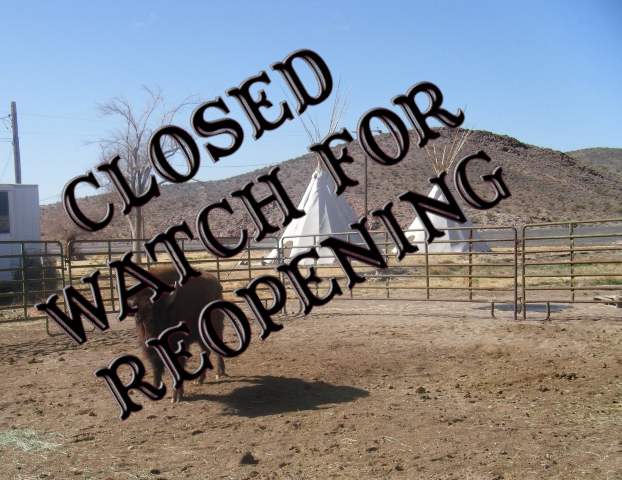 Spicer Ranch Trails- - is a 120 Acre working ranch with cows, horses and wild burro’s. The ranch has 2 large pastures with green grass and numerous fresh water ponds. These ponds provide habitat for the Amargosa Toad. 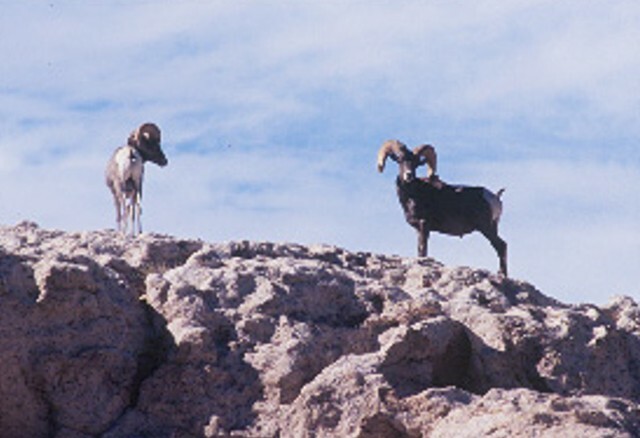 The ranch is open to the public year-around for mountain biking and hiking. There is a large public parking lot and kiosk with maps of area trails. The first seven miles of trails on Spicer Ranch consist of four trails: the Spicer Ranch Trail (2.5 miles), the Storm Trail (.75 miles), the Southpond Mountain Trail (1 mile) and the Dynamite Trail (2 miles). The trails range from easy to difficult. There are another 30 miles of trail opened on BLM land.